By 2005, there will be an estimated one billion Internet users worldwide. 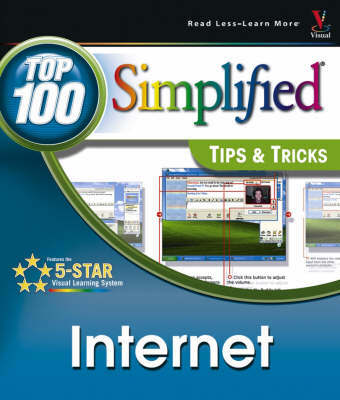 "Internet: Top 100 Simplified Tips and Tricks" is an invaluable resource for anyone who wants to make the most of today's Internet tools, get more done in less time, and save money. Organized into ten chapters, with ten tasks per chapter, this book is packed with timesaving tips, cool secrets, and productivity tricks to help take a reader's knowledge of the Internet beyond the basics. From Google and eBay to blogging, broadband, and browsing incognito, veteran author Joe Kraynak delivers 100 step-by-step techniques people need to become Internet power users. The perfect book for visual learners who have already mastered Internet basics. Full--color screen shots and numbered, step-by-step instructions show readers how to save time and boost productivity. This book shows how to speed up a connection, optimize Google searches, succeed with eBay, and protect a system from hackers and viruses.